So, what broader trends does this data suggest? In the simplest terms: there's an ongoing increase in digital video consumption and resulting revenue. In our view, digital video is pervasive--and it's now easy to integrate video into overarching digital media plans. The last link in the chain has been effective monetization and it's now finally catching up with digital consumption habits. Video continues to grow, and it's clearly a medium that content publishers are relying upon for revenue. Also, as the rapid surge in mobile ad revenue suggests, we're only beginning to skim the surface of opportunity that exists in mobile content and mobile video. Online video is not synonymous with "Web" video, and a truly complete video strategy requires monetized, secure, high-quality, measured delivery to all platforms and devices (i.e. via a Brightcove Smart Player). 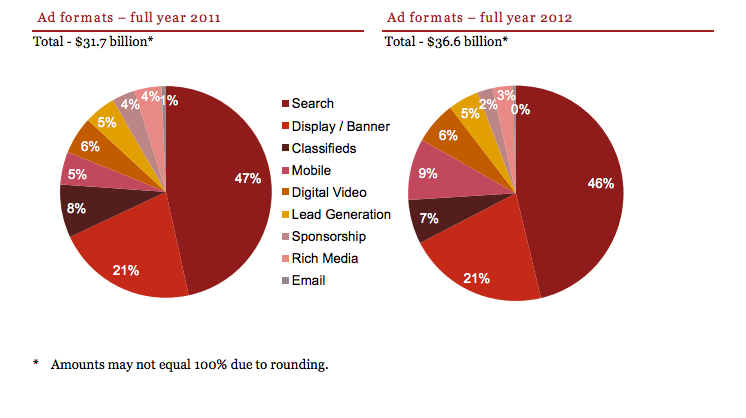 Below is an interesting graphic comparing revenue across ad formats in 2011 and 2012.